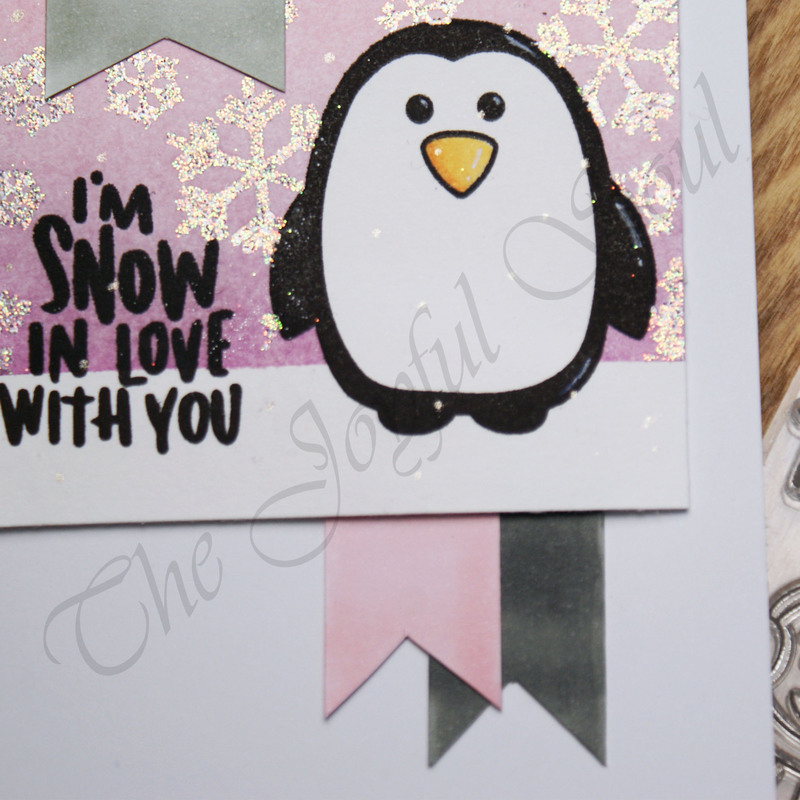 I began by stamping a sentiment and the large penguin from the Snow Much stamp set onto a piece of watercolour paper. I then masked off the penguin and a strip at the base of the panel for ground, and began ink-blending across the entire panel. I started with Spun Sugar Distress ink, then bought in some Milled Lavender and just a touch of Seedless Preserves for the very bottom. Leaving my masks in place I then added some heat embossing. I used each of the snowflakes from the stamp set and embossed with WOW! Cloud 9 Glitter embossing powder. 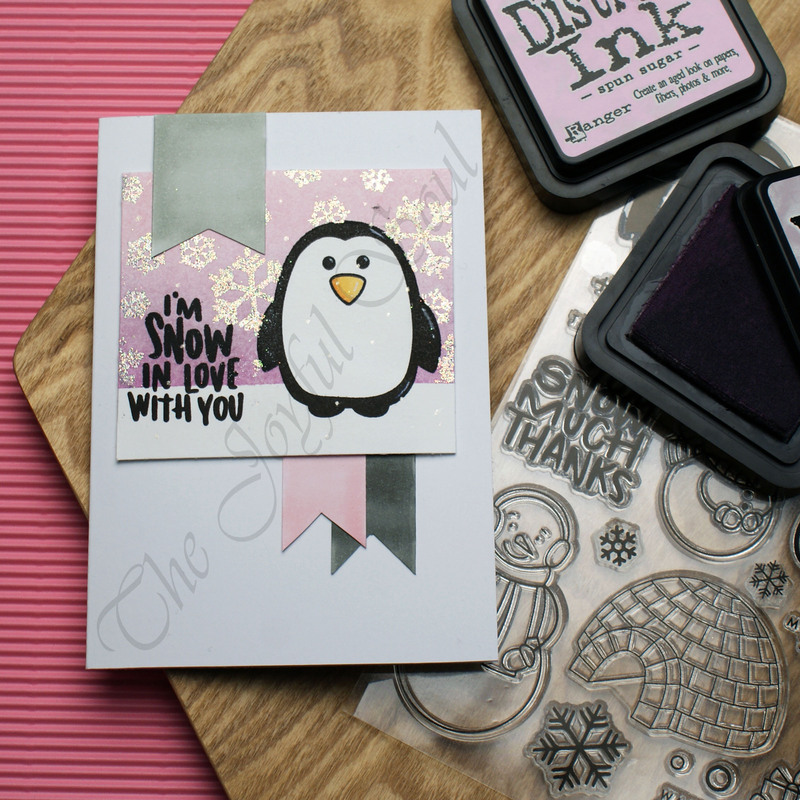 Once I’d finished the embossing I removed the masks and restamped the penguin and sentiment. I used a couple of Spectrum Noir Illustrator markers to quickly colour the penguin’s beak before going in with a glitter gel pen to add tiny snowflakes all over the panel. I used my markers again to colour in three snippet strips of patterned paper, one in pink and one each in dark and light grey. I trimmed the strips down and cut banner tails into the end of each. All that was left to do was to adhere everything together. I layered the pink and dark grey banner pieces together and adhered them flat to the cardbase with double-sided tape, before using foam adhesive to add the focal panel. I overlapped the remaining banner across the panel, using double-sided tape where it met the panel, and foam tape for the area that overhangs. This Valentine’s card is so cute and I think the soft colour palette works well. It’s not the traditional wintry, snowy colours, but I think it’s still clear that it is a winter sky. I really like the adorable penguin, and I’m sure I’ll have lots of fun with this stamp set. I do think maybe I should have removed the mask prior to adding at least some of the snowflakes as it would have made sense to allow some to be falling in front of the penguin. That’s just a minor complaint though. Overall I’m pretty pleased with the design. What a great card, Charlotte! I love the bold sentiment and penguin. Your masking really added so much to this one layer image. Your combination of pinks and lavenders in the background really soften the effect of all that black stamping. Love the heat embossed snowflakes, too. This is such a well designed Valentine’s Day card! Well done! 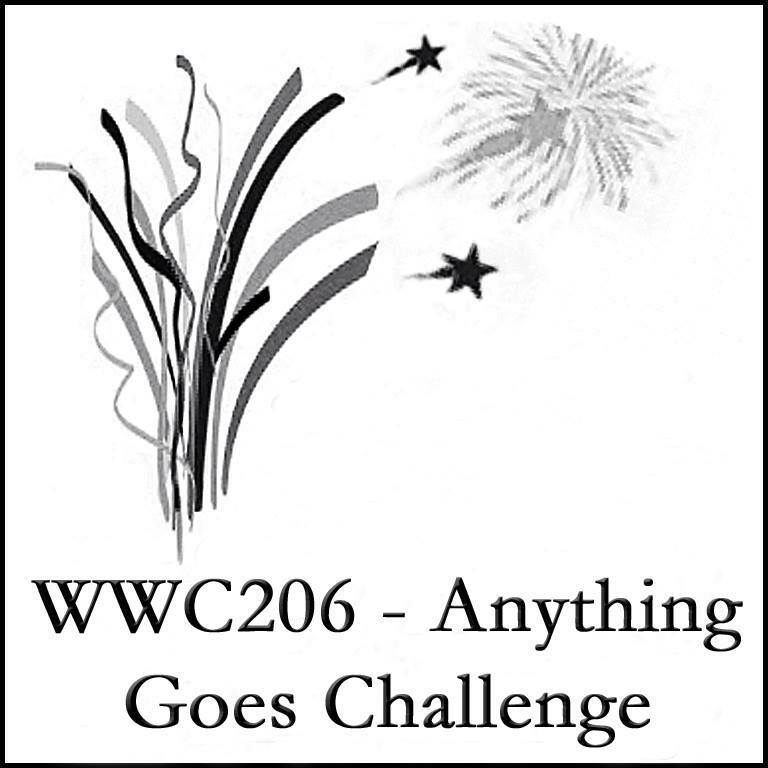 Thanks for playing at the Theme and Sketch challenge at STAMPlorations! This is so adorable! I love those shimmery snowflakes and the cute penguin! Thanks for joining us at Fusion!